Well, time for another belated post. Buckle up, this could take a while, as it took place back in May. 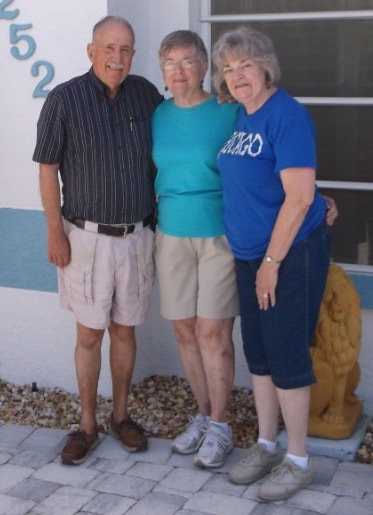 My mother wanted to visit her sister (one of three sisters, in all) and brother-in-law in Florida, but didn’t really want to fly. She’s not afraid to fly. She just prefers to travel by land to enjoy the scenery, and be able to stop for sights and souvenirs and such. When her Plan A, Plan B, and Plan C arrangements all fell through for either sharing the drive or taking a train to Florida, I volunteered to step in. Plus, I’d get to see my aunt and uncle, so there was that. We hit the road early on a Monday morning, and our route took us from Michigan into Indiana, through part of Ohio, and across Kentucky. We stopped for lunch in Georgetown, KY at a place called Galvin’s. Not only was the beer and food delicious, our server, Dee, was fantastic. So much so, that we stopped again on our way back home. Dee was even kind enough to sit for a picture. 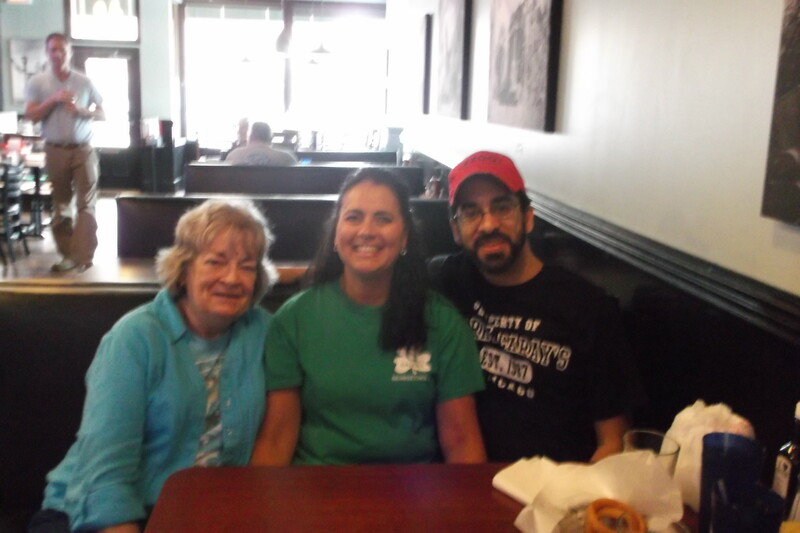 Mom, Dee, and me at Galvin’s in Georgetown, KY. Great place, and Dee is fabulous! We continued on our way, and spent the night in Chattanooga. Tennessee was truly a beautiful drive. The miles of highway winding through mountain passes lent themselves to some breathtaking views. Mom got lots of pics of the drive down and back, and once we get them loaded from her camera I will add some of them here to my blog. As we continued into Georgia and Florida, we encountered some fun highway exit signs. At least they were fun to us. The names on some of them were so fun, that I said I was going to use some of them to name my future children. This would mean my future daughters would be named Unadilla Valdosta, and Syracuse Ocilla, while my sons would wind up being Eldorado Omega, and Montezuma Hawkensville. We laughed for miles about this. We had been driving a long time, and were very tired. Plus, we’re weird. Just go with it. Mom, plotting our course to Florida over lunch. For you young kids out there, that thing she’s holding is called a “map.” Ask your parents. Again with the maps. Mom, plotting our course home during our stop-over in Chattanooga. We arrived at my aunt and uncle’s home safe and sound, in spite of encountering a couple torrential rain storms, several horrible drivers who tested my reflexes, and some giant styrofoam spheres that apparently came off the back of some truck. All in all, I was able to keep us out of any and all “Final Destination” scenarios. …and for miles ahead of us. Caught in a torrential downpour. The photo doesn’t do it justice. Ahhh, after the deluge…a double rainbow! It really was a joy getting to see Alice & Pete again. To this point, I had only seen them a handful of times since the funeral of my grandmother – my mom and aunt Alice’s mother – in 1980. So there was a lot of catching up to be done, but my plan was a simple one: stay in the background. Yes, I was going to visit and enjoy their company; but when it came right down to it, the trip was about mom getting to spend time with her sibling. I have a half-brother who is seven years older than I, but we’ve never really been what I would consider “close.” So, for all intents and purposes, I’ve been more of an only child. That said, most of my close friends have multiple siblings, and I know how much those relationships mean to them. With that knowledge in mind, I wanted to be sure to allow as much time for mom to spend with her sister. This trip was not about me. It wasn’t even about us. It was about her. While they did their thing, I stole…ahem…I mean…I borrowed mom’s car, and drove up to Saint Petersburg, where I hit a couple brew pubs, and caught a Tampa Bay Ray baseball game. And, yes, I spent a lot of time by Alice & Pete’s pool. I mean, c’mon, I’m not stupid. The house cured bacon at Urban Brew & BBQ is no joke! Get you some! There was still plenty of group time, as well. Cap’n Pete took us all out for a ride on his boat, we took a drive around Pine Island, and went out for ice cream. Chef Pete grilled up a drunken chicken for us (I still don’t know how he got the chicken to drink all that beer), and made breakfast for us each and every morning. Between the delicious meals, and the beautiful pool, I threatened them several times that I was just never going to leave, and would simply live in their back yard. Being that I am unemployed, I could have easily made that happen, so that may have frightened them just a little. Mom enjoying the boat ride…and making sure her hat doesn’t fly off! Uncle Pete at the helm, and me out on the bay. Chef Pete revealing the drunken chicken…which was delicious! As with most trips, the end came all too soon. It was time to pack up, and hit the highway back to Michigan. After our sad goodbyes, we headed back north, stopping off in St Petersburg so mom could experience the food (and beer) at Urban BBQ and 3 Daughters Brewing. We then continued on to Jacksonville, where mom got her first in-person look at the Atlantic Ocean. Flights of beer in Jacksonville, FL. We earned them. After a couple of stops in Kentucky, including one more visit with Dee at Galvin’s in Georgetown, we slowly made our way back to Kalamazoo. 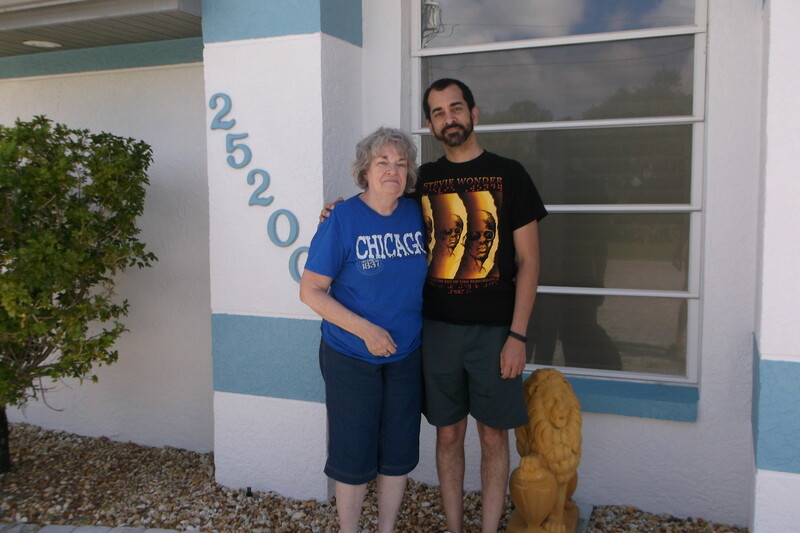 It was a great trip, and not only was mom able to spend time with one of her sisters, but it gave us plenty of time to talk and reconnect as mother and son.